ART Engineering LLC (ART) is a remediation company specialized in ex-situ soil treatment using Soil Washing, Bioremediation and Thermal Desorption Treatment Systems. ART principals have 25+ years of full scale project implementations and backgrounds in Mining, Mineral Processing and Contaminated Soil Remediation. ART provides specific project treatability studies and evaluations to determine which of these remediation remedies, or combination or remedies, is best suited for the project. ART always looks for the most cost effective solution among these technologies that meets our clients' goals. The proven cost effectiveness of Soil Washing is in volume reduction of contaminated soils, re-classification of contaminated soils from hazardous to non-hazardous and in some cases 100% onsite reuse and/or recycle. ART’s Soil Washing Plants are engineered as constant-feed-closed-water-loop systems. ART provides specific project treatability studies to determine which soil treatment remedy, or combination or remedies, is best suited for the project. These treatment remedies include (but are not limited to): Soil Washing, Bioremediation, Thermal Desorption, Soil Oxidation and Soil Stabilization. ART will determine the best remediation approach based on the material characteristics, range and distribution of the contaminant(s) of concern, project treatment goals, and economics. 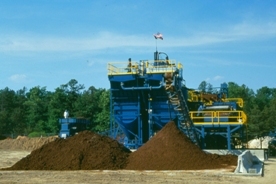 The ART treatment plants are built to heavy duty mining and material handling grade. Typical plant process production capacities can range from 10 to 100+ tons per hour and can be operated 24/7/365. ART is recognized for providing quality detailed work, always being on time and for recognizing the need to remain flexible and adjusting to changing conditions. We value building long term relationships with our client based on quality of work, integrity, responsiveness and cost effectiveness. US, Canada, Spain, France, Italy, Netherlands, Gibraltar, Brasil, Korea and Japan. Hazmacon 1994 - "The Best Technology Development in hazardous Waste Treatment"